0. My Center: How is the weather in my core? I Spy: A pet weakness. Something I perceive within myself as troublesome or flawed. I Listen: What does it have to tell me? What is the hidden strength in it? You Spy: A trait others see as one of my weaknesses. I Adapt: How can I best adapt and turn this into a strength? Is it truly a weakness at all? Vulnerability: The nature/expression of my softness and vulnerability. Power: The nature/expression of my fortitude and personal power. First up: (cause nothing goes without saying now that we’re all post-truth) when I write about “weaponizing perceived weaknesses,” I’m writing metaphorically, about weapons of heart, mind, communication, and dissent. This tarot spread is not a call to violence. (I hope I’m correct in saying that no tarot spread is a call to violence, but it’s a big, weird world with a big, weird internet.) I don’t judge those who use violence in self-defense, but I believe it should be a last resort. Nonviolent resistance and civil disobedience get better results with less harm done than violent attacks that can be used to justify campaigns of vilification, state violence, and terror against all opposition, violent or peaceful, regardless of justice. So what cause do we have to metaphorically weaponize our perceived weaknesses? What does that even mean? We all have areas of strength and weakness, but perceptions around these are easily distorted. Great strengths like sensitivity, empathy, tenderness, kindness, and honesty are reviled as weaknesses and devalued by those who see strength as incompatible with tenderness, intelligence and reason as incompatible with emotion, and power as synonymous with brutality and greed. In an ongoing war against the divine/empowered feminine, powerful players in Western societies have alternately vilified and trivialized traits deemed feminine for millennia and counting. Variances in identity and worldview, and the many qualities that make us unique, are mocked, degraded, and dismissed by those strongly attached to their own identities, who may see their race, religion, gender, or orientation as superior to others, or may feel threatened by changes to their status quo. Valid observations and critiques about the treatment of marginalized groups go ignored or condemned by those unwilling to acknowledge difference and privilege. Dissidents, protestors demanding the change, accommodation, and respect they need and deserve, the young, and the uppity, are ridiculed and written off as “special snowflakes” by those who don’t feel like being contradicted or challenged. With prejudice, systemic oppression, and the terrible isms woven so tightly into the fabric of our culture, it’s easy to internalize the judgements we hear from others and dismiss or distrust our own emotions, perspectives, and identities. 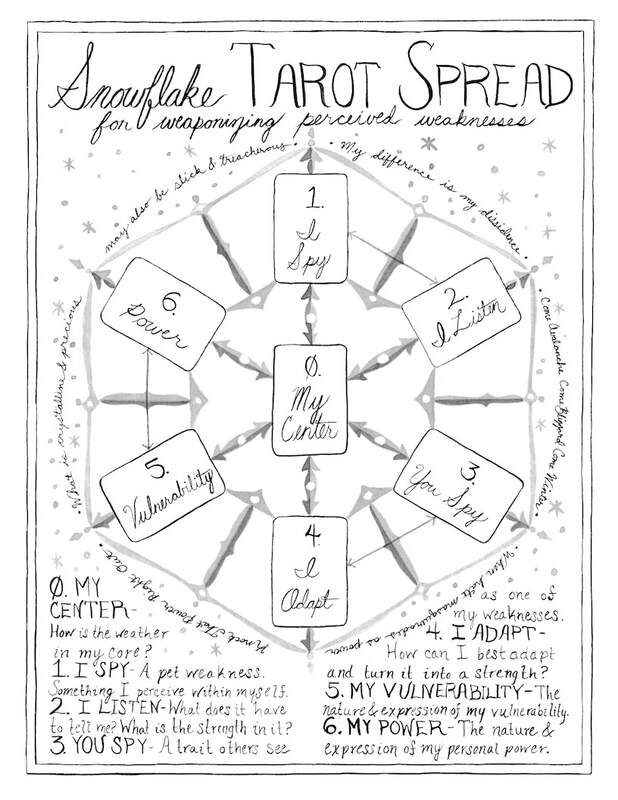 This spread is not for dodging responsibility for our flaws or enabling fragility. Most character traits envelop both strength and weakness, and we’re on the hook to account for both. The goal here is to bring some balance back to those qualities viewed through a disproportionately negative filter. To that end, Cards One and Two examine areas where we feel weak by our own accounting, and how to make improvements. Cards Three and Four examine areas where others call us weak, and how we might turn these traits back to our advantage. Cards Five and Six shed light on the interplay between our personal senses of power and vulnerability. The central card, numbered Zero because it stands out of order, asks “what’s the weather like in my core?” Though the phrase “my core” sounds very intimate, try not to take the messages here too personally. Think of this as representing the baseline you’re operating from at the moment, rather than a lasting reflection of your deep, inner being. Peeking at your most shiniest immortal soul is tempting, but not helpful here. That part of you is too big and transcendent to stand in proportion with the rest of the questions we’re asking. It’s more useful to see how outer circumstances interact with your interior, and what passing moods and themes impact you deeply at this time. This inquiry can go deep, but it isn’t permanent and it isn’t you, at least not the whole of you. If you’re dealing with particularly challenging circumstances, you may draw a challenging card in this position, and that’s appropriate. For instance, if you have a lot of change and upheaval going on around you, the Tower might reflect your inner weather, indicating that you’re feeling shaken to your core. However, this doesn’t mean that you, personally, are a walking disaster at your core. If you’ve been running on fumes with a lot of draining circumstances around you, the Four of Swords might reflect the weather in your core, indicating fatigue down to your bones and a need to rest before you get sick. That doesn’t mean that you’re sick, tired and static in your personality or your soul. Mind how each outer card relates back to that central Zero Card. If each card were a person engaged in a conversation, what would the outer folks say to the meteorologist in the middle? We always have a choice whether to accept or reject the criticism we receive. Although this spread was inspired by ridiculous, destructive criticism and name-calling that we need to break free of, I expect this spread to operate ambiguously in practice. Some perceptions of weakness are accurate, and constructive criticism can be immensely valuable. Pay careful attention to the context of Cards Three and Four, and how they relate to Cards Zero through Two. Pay attention to the feelings they provoke. Do the cards’ themes prompt embarrassment because they feel true or frustration because you know better? The reading’s context, your emotional impulses, and your intuition should help you figure out whether you’d best embrace or oppose this criticism. Your response might be complex. With discernment, you can develop approaches that both entertain constructive criticism and deflect destructive noise. This is a water spread. It has all the many feelings. The classical elements correspond to states of matter. Earth represents solids, water represents liquids, air represents gasses, and fire represents plasmas. However, when we set aside the academics and consider the elements as we interact with them, they hit us close to home. We recall the mud beneath our feet, the water, wine, or milk in our cups, the sound of rain, the wind howling at night, the air we breathe, campfires, candles, and the scents of smoke and spices. From this immediate viewpoint, we can consider water in each state of matter we encounter: solid, liquid, or gas; hot, cold, or tepid. • Creativity: Turn this into a spread for navigating critiques. In Cards One and Two, critique your own work and process, brainstorm improvements to make, and think about what hidden strengths may lie within your rough patches. In Cards Three and Four, process the external criticism you receive. What criticisms weigh on you most heavily? Are they constructive or destructive? Objective or subjective? Delivered in a spirit of mutual support or competitive backlash? Will it serve your project best to embrace a particular critique and adapt your work? Or is it best to stick to your guns and strengthen what you did before? In Cards Five and Six, meditate on how you express vulnerability and power through your work, and through the critiquing/editing process. Remember that delivering and accepting constructive criticism graciously are skills unto themselves, and take practice. • Career: Prepare for that most tired of interview questions, “what is your biggest weakness?” Cue the humble bragging and media spin. Job interviews may feel like baloney-and-a-half, but there’s genuine merit in weighing both sides of any given trait when evaluating and advocating for your work. In Cards One and Two, perform a self-assessment of your work and career trajectory. In Cards Three and Four, consider problems others have raised with your work, how you might improve, and any areas where you need to reject or parry critiques to stand by your values. Be discerning about when to compromise. 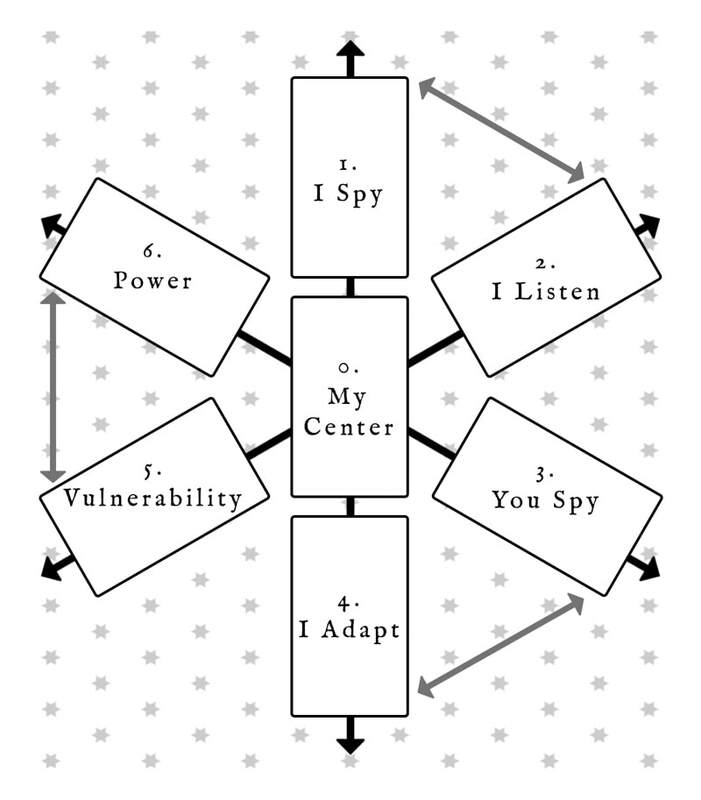 In Cards Five and Six, check where your vulnerabilities and strengths are most visible and impactful on your work. • Relationships: Explore power dynamics in a relationship, bearing in mind that the cards can’t speak for other people absent from the reading. In Cards One and Two, check in on a personal insecurity that impacts your relationship, and what you can do about it. In Cards Three and Four, examine a way you feel criticized by your partner. This may be something you feel subtly although it’s never been stated, or it may be something your partner has complained about vocally and directly. Is this something you can and should address? Do you need to compromise and do better in this area? Is it something you need to stand by or celebrate about yourself? Is there a strength lurking within a quirk or foible? In Cards Five and Six, look at how your vulnerability and power are expressing within and acting upon your relationship. Is the dynamic healthy or does it need some adjustment? This line of questioning can get tricky and loaded. Keep an eye on the lines between power and control, criticism and abuse. While tarot makes for a great agony aunt in the hands of a reader with good sense, it can only do so much, especially when things get heavy. Sometimes tarot, tea, and sympathy get the job done. Other times may call for a therapist, a sit-down with your partner to get their side of the story, input from friends or family you love and trust, a good lawyer, or even an exit strategy.